Development Camp isn’t a device that is designed to fill out an NHL roster. The majority of the players invited to these camps are preparing to return to school or junior, not the NHL. However, there are always a few prospects that stand out above the rest. The Sabres 2012 Development Camp provided the opportunity to see a trio of players that will likely be directly tied to the franchise’s future. 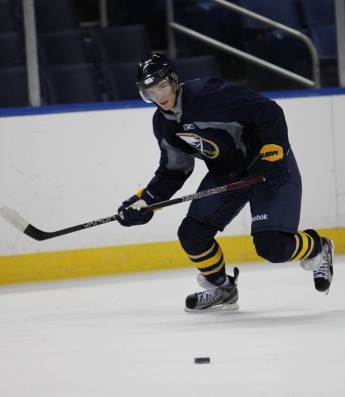 Joel Armia, Zemgus Girgensons and Mikhail Grigorenko all participated in their first development camp with the Sabres after being picked in the first round of the last two NHL Drafts. Joel Armia will be NHL ready once he comes over from Finland. Armia missed out on the 2011 Camp due to complications getting to North America so soon after the Draft. Armia had an improved season with Assat of Sm Liiga and a point per game pace (5+2) at the World Juniors. He was dynamic at many times during development camp. His size set him apart and it was clear that two full seasons of professional hockey has aided his development. While he is bound to Finland for another season, I doubt that Armia will have much trouble adapting to the NHL game when he arrives next year. What was most impressive, to me, was his ability to create in tight spaces. On a number of occasions he found ice for an open shot despite being in close quarters. The fact that he was able to do so on a daily basis was truly what stood out over the course of last week. In tandem with Grigorenko at center, the line has the makings for a talented, dynamic and explosive offensive unit. Whether or not Girgensons is part of the line is up for debate. Having him ride shotgun for the two big guns would be an interesting development, but he would likely be better served on a separate line from Armia and Grigorenko. Grigorenko was one of the players entering camp with the opportunity to build a resume that would eventually lead to a contract and a chance to truly make an impression at training camp. Outside of those who saw NHL action last year, Grigorenko and Girgensons were the only two at camp who really had the opportunity to jump directly into the professional ranks. Girgensons contract all but ensures he will see plenty of time playing against men in Rochester for the 2012-13 season. Signing him and getting him into the professional game will be the best step for his development. As for Grigorenko, he may be looking at another season in the Q. While his skill more than evident, his overall strength seemed to be lacking. It seemed as if there were those who expected Grigorenko to zip down the ice with ease and score on every shot. While that is a completely unreasonable standard, he was showing plenty of traits that would indicate he is close to NHL ready. 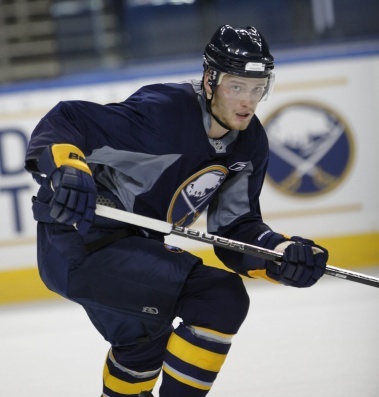 Grigorenko will ultimately be given a fair chance to make the Sabres in camp. In fact, it would be wise to give him the requisite nine-game audition to start the year before making a final decision. If I’m guessing, he will be back in Quebec next year. Even with some physical shortcomings, I liked what I saw from Grigorenko last week. Both Armia and Grigorenko showed plenty of offensive prowess during the week and could conceivably end up as linemates once they arrive in the NHL. The thought of that pair of battleships cruising down the ice and creating offense could solve a lot of goal scoring questions for the Sabres for years to come. Armia has the ability to lurk in the weeds waiting on offensive chances. Meanwhile, Grigorenko isn’t afraid to steam up ice with the puck before finding an outlet. Whether that outlet is Armia or the back of the net matters not, ultimately the puck will be in the same location. Considering that Grigorenko and Armia will be each gestating for one more season of development, they should be poised to make their NHL debut together in 2013. While another year of waiting is the last thing Sabres fans want to see, the future they’re waiting on is quite bright. Asking Sabres fans to wait yet another year to see some real fireworks is sort of like having to wait until December 26 to open your Christmas presents. However, it would appear that the prospect pool is finally ready to turn over a set of elite players who could lift the Sabres to the next level. Previous Article Could defensive depth provide trade leverage?